One such feature is Stories: timed pictures or video clips that users can deck-out with text, filters, or stickers to spice-up their content. And it seems like every major app is jumping on this trend with Messenger, Facebook, and most recently YouTube creating their own version of a Stories feature. However, the jury is still out on the best ways to use them. Well, we’re here to help you figure that out. 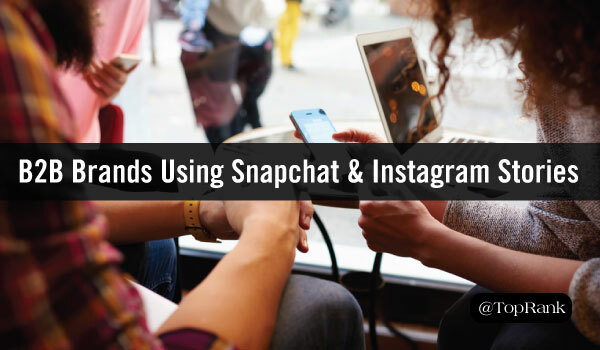 Here are five B2B brands using Snapchat and Instagram Stories and how they’re using them to their advantage. One of the best ways to connect with an audience is through shared values. Cisco is well aware of this and utilizes their Snapchat Stories to share how their company and employees are making the world a better place. And because authentic content is seen as more genuine, Cisco actually allows their employees to run the account themselves. This way, their audience can see a true glimpse into the lives of Cisco employees and how they help others. 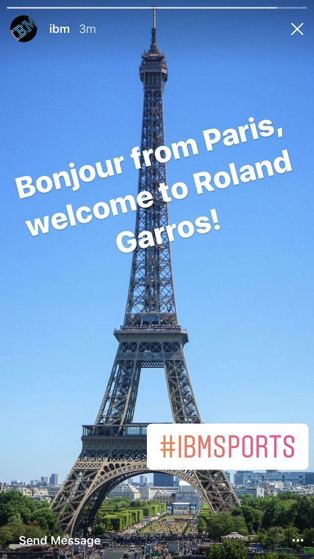 One of the key benefits of promoted Instagram or Snapchat Stories is that they allow you to geotarget your audience and create unique geofilters. With these features, brands can serve targeted Stories and custom filters to their audience based on their location. IBM has used this to their advantage in the past by creating special filters for their industry events. IBM can then promote the filters to event attendees and followers can see updates live from the event floor — creating an easy way for IBM to send relevant content to the right audience. Brand storytelling at its finest. That’s how I would describe Google’s use of Instagram Stories. With Stories, Google shares brief vignettes with narrative captions to share inspiring stories of people using their products. Watch just a few and you’ll see how they sink their teeth into you and build up anticipation, encouraging you to complete their call to action and watch the full video. It’s a really effective and meaningful way for Google to share exactly how their solutions help solve both individual and global problems. GE is known for being an innovative company. But can you name exactly what they do? You might be able to name a few things, but the reality is that GE does too many things to name. 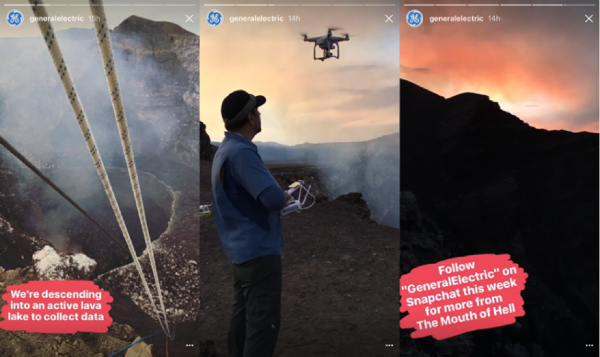 Because of this, GE has been using Instagram Stories to share the unique things they do all over the world. Most notably, they took us deep into a volcano to sample active lava. Each story helps paint a picture for their audience, changing their public perception from an industrial giant to a creative innovator. Mailchimp, everyone’s go-to email service provider, uses Snapchat Stories to share scenes from fun events, creative images, and funny videos. With smart brand apparel, a hip monkey named Freddie, and really cool artwork, Mailchimp has an endless supply of creative and eye-catching content to share. And while it may seem like there’s not a unifying theme behind their Stories, it actually does a great job of showing off their brand’s eclectic personality. Through witty commentary and funky images, Mailchimp has personified their brand, building strong relationships with their followers. Don’t be hesitant to take the next step for your brand’s social media marketing. For more ideas on how your B2B brand can up your social media game, check out these social media tips and examples or our guide on Snapchat for B2B brands. Not ready to expand your social media marketing on your own? Find out how we can help by taking a look at our social media marketing services. I would add Zendesk, Shopify, Socialbakers, ALKU, Gartner, Hootsuite, to name a few, as well.